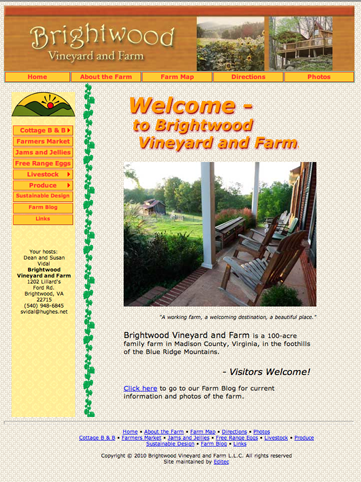 Here's a web site we finished recently for Brightwood Farm. The complete site has 27 pages, including links to a blog and Google maps. The owners are able to add current information and photos easily using the blog. They can monitor the traffic to the site using Google Analytics. Editec was responsible for the design and layout, edited the text, and scaled and processed the photos. We believe in simple, direct, and uncluttered designs. The fewer the visual distractions, the better the chances of getting your message across.